January 28, 2019 By Chelsea T.
Surprise that special someone in your life this Valentine's Day by adding a terrifying twist to your festivities. How? With some horror, of course! Guthrie Haunts will be opening their doors for a special event, "My Vexed Valentine." 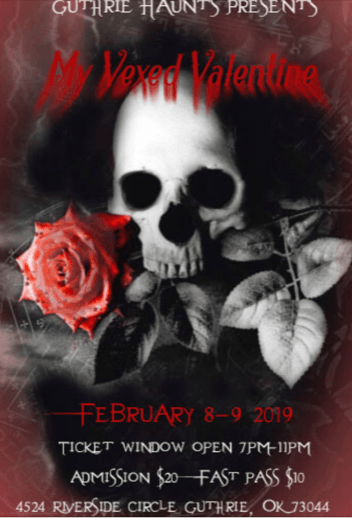 The Valentine's Day haunt will take place on February 8th & 9th from 7:00-11:00 PM, giving locals two nights of terror long after the Halloween Season has come to an end. Those brave enough to enter will encounter tons of creepy creatures inside haunting areas such as the Zombie Wedding Chapel, Morgue of Love, Vortex of Love, and more! Your significant other won't be able to forget this Valentine’s Day – no matter how hard they try! And don’t worry – there’s something for everyone at Guthrie Haunts, so if you are riding solo, there’s plenty of scares that await for you, too!